On Monday, we were Remembering Our Veterans in Morning Feature, you shared your stories of offline political activism in Things We Did This Week, and addisnana said Thanks Technology! in Midday Matinee. On Tuesday, the Squirrel continued his screenwriting efforts with Elitism and You in Morning Feature and readers helped tell Tuesday’s Tale: Camera-Shy Minnie in Midday Matinee. On Wednesday, the Squirrel ranted on A Book Tour to Nowhere in Morning Feature and addisnana mused on Sports and Kids in Midday Matinee. On Thursday, the Squirrel pondered ‘Rational’ Austerity Meets Reality and triciawyse brought us Fursdai Furries in Midday Matinee. On Friday, we discussed The Beltway Media Feeding Frenzy in Morning Feature and triciawyse shared Friday Critters in Midday Matinee. On the weekend, we celebrated Millennials and “The New New Left” in Saturday’s Morning Feature, Ms. Crissie was asked Who, Me? in Sunday’s Morning Feature, and winterbanyan shared My Doctor Pushes ACA in Midday Matinee and brought our weekly Eco News Roundup in Our Earth. Thus we return to the empty donut box left by “They,” as the resident faculty made their way from the wine cellar library where they spent the weekend drinking thinking on our motto of Magis vinum, magis verum (“More wine, more truth”) to the hot tub faculty lounge for their weekly game where the underwear goes flying planning conference. The staff were fairly certain “They” were, in fact, the resident faculty. Still, we assigned our crack investigator to the case. But he got grumpy, perhaps because he hadn’t had breakfast. “I put macadamias out for you,” Chef said as she sliced the pecan danish ring. “No, that They was Them,” the Squirrel texted. 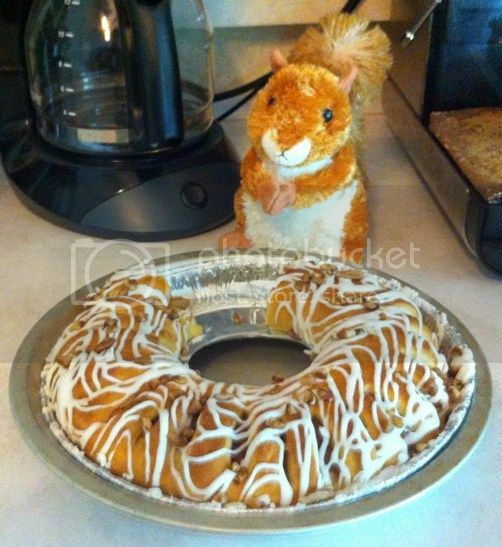 “They were meeting, yes,” the Squirrel texted as Chef scraped some stray pecans into his bowl. “The resident faculty, or ‘They’ They?” Chef asked. “Or on the grassy knoll behind the hot tub faculty lounge squirrel bath,” the Squirrel texted as he nibbled a pecan. “The resident faculty, or ‘They’ They?” Chef asked again. “Yes,” the Squirrel replied again. They can be mysterious when They want to be. Squirrels, that is. This will be an interesting week, then. ‘They’ were not happy with President Kennedy, and so there are many ideas about who killed him. Interestingly, I watched a Nova episode yesterday afternoon that analysed the latest science in forensics and ballistics to show that Oswald could have indeed acted on his own and cause the wounds that were seen. There was even talk about how the brain can cause all the nerves to fire at once when there is a huge trauma, and this would have caused President Kennedy to arch back when he was hit from behind. I remember reading several books on the subject of the assassination that used this fact as ‘proof’ that there had to be another shooter from the front of the car. On a personal note, I have always had a problem when talk turns to how my family reacted to the news of the assassination. Unfortunately, my family was at the time strongly under the influence of the John Birch Society. Need I say more? I was appalled by the news, and this could have been my first break with my family on politics. I couldn’t understand my grandmother’s obvious happiness that he had been killed. Comparing her reaction to my friends’ families, it was horrifying. Modern forensics have shown pretty conclusively that two shots by a single shooter on the sixth floor of the Texas School Book Depository (a third shot missed) could indeed have caused every wound described in the Warren Commission report, without any so-called “magic bullet” mid-air course changes. Even if there were a conspiracy and Lee Harvey Oswald were their fall guy, it would make sense for the conspirators to put a single shooter in the building where Oswald worked. Having multiple shooters in Dealey Plaza would have created too much risk that investigators would recover bullets fired from multiple rifles … and that would ruin the conspirators’ single-fall-guy plot. So both the forensic evidence and common sense suggest a single shooter in the sixth floor window of the Texas School Book Depository Building. Whether Oswald was that shooter – and if so whether he acted alone – are questions that forensic science can’t answer. I was a little over a month shy of my third birthday when President Kennedy was shot. I don’t remember my dad celebrating the shooting, but I do remember him grumbling about the funeral coverage on TV. Wow on your grandmother’s reaction and I’m guessing she wasn’t the only one. I was a senior in high school. I don’t remember the news covering people like your grandmother. Today’s news media would be all over it. The ultimate conspiracy theory for me would be that someone from within the USA did this and tried to blame it on communists or pick your external enemy. That would be the scariest because I am sure there is at least as much hate against Obama as there was against Kennedy. That scares me a lot. I hope that’s at least some comfort. Thank you for the facts. They help a lot. Like many, the moment I learned of the assassination is forever stamped into my brain with extraordinary clarity. So were the hours immediately preceding it. I was 13 at the time, and shocked beyond description. This kind of thing had never entered my life before. The only joy I heard in my family was when my mother cheered Jack Ruby for shooting Oswald. That shook me, too. Jack Ruby deprived us of a trial that could have answered many of the questions that to this day keep the conspiracy theories rolling. Looking forward to this week’s discussion. A trial of Oswald might have helped some, but consider that Sirhan Sirhan, James Earl Ray, and John Hinkley were both tried and conspiracy theories still abound about the assassinations of Robert Kennedy and Martin Luther King Jr., and the attempted assassination of Ronald Reagan. As conspiracy theories began swirling within hours of the JFK assassination, I suspect a trial would have simply given conspiracy theorists more fodder. I agree a trial might not have put a lot of conspiracy theories to bed, but it raised a whole range of new ones about Oswald being killed. Also, I think it deprived the nation of a much needed catharsis.